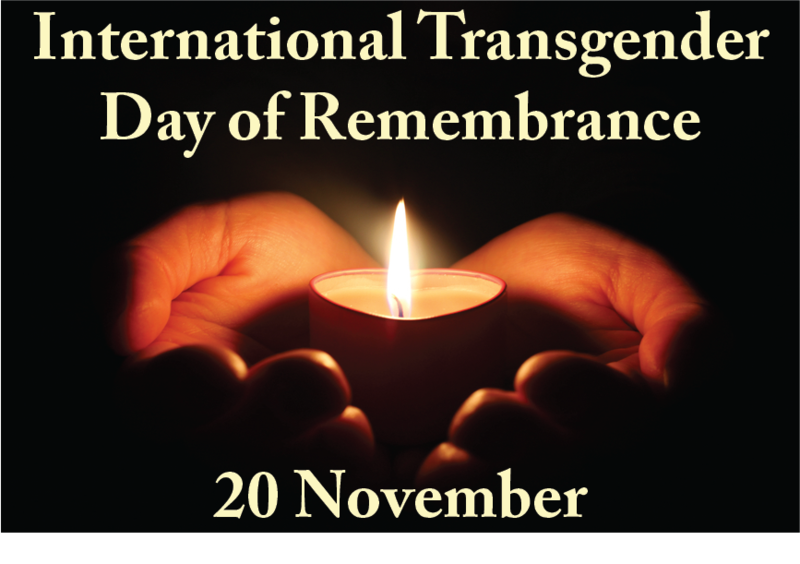 International Transgender Day of Remembrance (TDOR); a day set aside to annually memorialize those who were killed due to transphobic hatred or prejudice. Originally to honor the life of Rita Hester, a transgender African American woman who was murdered in Allston, MA in 1998, today communities around the globe gather annually on 20 November for public worship and vigils. It’s an important act: to memorialize the dead, particularly those killed for being who they are. It’s an act that allows for the public processing of pain, a necessary requirement to social change, according to theologian and Bible scholar Walter Brueggemann. As of the writing of this piece, there are 226 names on this year’s list. 226 people killed because they were perceived and/or known to be “gender non-conforming.” That’s more than 18 deaths per month, the youngest: 8 years of age and the oldest: 55. Many more are physically and verbally attacked each month, sometimes on a regular basis. Not surprisingly, most of these cases remain unsolved. There are no statistics for the number of suicides resulting from harassment for being transgender, but we can guess that it is likely to be high. We need to publicly process this pain. Not just for the transgender and genderqueer communities, but for all of us. We need to wail and grieve the loss of life. Our Allies need to be reminded of the urgency that drives us to work to change the world. Potential Allies need to be taught that lives are literally at stake. And those who are just noticing that there are transgender/genderqueer people in the world need to know that every time we leave our homes we are risking our lives. EVERY.SINGLE.TIME. Those of us still living need to be reminded that we are not only the survivors, but that our lives matter. What makes today a complicated day is that while we have set aside a day for memorializing our dead we’ve not yet set aside a day for celebrating the living. The unintended message we are giving, particularly to our newest members of the community, is that your death, and more particularly your murder, has more meaning to our community than your life. When will we set aside a day (or multiple days) to celebrate the wonderfully diverse and beautiful ways in which we live our “gender non-conforming” lives? When will we gather in communities to praise the good deeds and healthy living of transgender and genderqueer folks among us? I yearn for a time when instead of memorializing transgender and genderqueer individuals who have been killed for living their/our lives authentically, we will take time to celebrate the gifts these individuals offer our communities. Until then I will attend the vigils, not only to remember the lives lost, not only to offer to the transgender communities a supportive religious voice, but to remind myself and others that we are surviving and our lives do matter.